C1625. HERMANN ABENDROTH Cond. Leningrad Phil. : Symphony #1 in C (Beethoven); Symphony #5 in e (Tschaikowsky). (Canada) St Laurent Studio YSL T-627, Live Performance, 31 Oct., 1954. Transfers by Yves St Laurent. “Hermann Abendroth (1883–1956) deserves a greater reputation than he has. His neglect is largely due to the fact that he was active in a generation of giants, being a contemporary of Furtwängler, Klemperer, Toscanini, Stokowski, Walter, Beecham, Mravinsky, and Mengelberg, to single out just some of the leading lights. He held the post of Kapellmeister of the Gürzenich Orchestra Cologne from 1914 to 1934 but was removed by the Nazi authorities because he was found to be too sympathetic to Jews. However, he subsequently had a thriving career. He was appointed Kapellmeister of the Leipzig Gewandhaus, to replace the Jewish Bruno Walter, and he remained there through the Third Reich while regularly conducting the Berlin Philharmonic and appearing at Bayreuth in 1943 and 1944. After the war Abendroth found himself in East Germany, and because of his Nazi associations he was barred from conducting briefly. He protested that he had never attended any political rally or meeting, which ultimately led to his name being cleared. The Communists appointed him as head of the Radio Orchestra in Leipzig. The bulk of his late career was spent in Communist-controlled countries, including Russia and Czechoslovakia, but also Scandinavia. Abendroth’s style is not easy to pigeonhole. He tended to favor extremes of tempo, so slow movements (or sections of movements) might be slower than the norm, and conversely quick tempi tended to be on the fast side. 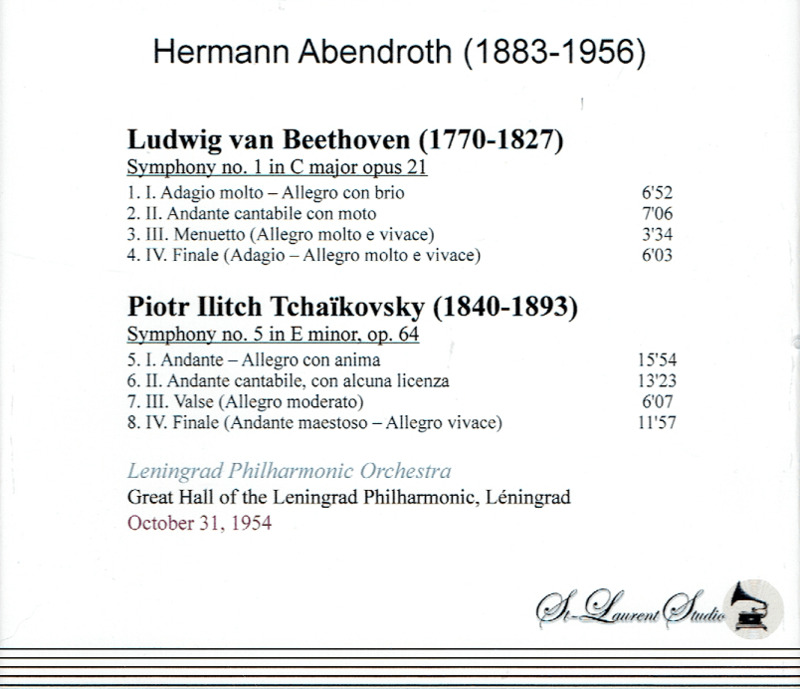 The Beethoven and Tchaikovsky performances on this new release, which comprised a concert Abendroth gave with Evgenyi Mravinsky’s Leningrad Philharmonic, demonstrate the conductor’s volatile temperament. Ronnie Yip, in FANFARE 18:2, noted that Abendroth made ‘generous use of tempo fluctuations’ in Tchaikovsky’s Sixth Symphony, and so it is here in the Fifth. The performance of Beethoven’s First Symphony manages to be both granitic and flexible at the same time. The orchestral sound has weight. The double basses and cellos are more forward than one is used to from Mravinsky recordings, but the texture is never overly heavy. Think of Klemperer with added grace and a smile. The Tchaikovsky is a major performance. Since by 1954 the orchestra had played this music repeatedly under the strong-willed Mravinsky, it is a testament to the strength of Abendroth’s musical personality that he could fashion something considerably different. The Adagio molto introduction is extremely slow but delicate and lyrical rather than weighty. Then the transition to the main Allegro con brio is done gradually. It takes a minute or two for Abendroth to reach what is ultimately a relatively normal tempo, and once he does, he applies further acceleration. Throughout all four movements, this is a mercurial, flexible performance. What makes it special is the conviction with which it is presented, both from the conductor and the musicians. One feels that one is participating in an event, not just a standard reading of an oft-played work. There is an intensity to the playing that grabs and involves the listener. Abendroth manages to encompass the lyrically beautiful and the dramatically powerful into a unified whole. 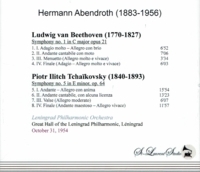 "...[Abendroth] was a bright star in the constellation of German musicians. His recordings are less rare than little known, especially in the West. Though most are late, they are all in the old manner and warrant attention from anyone with an interest in musical traditions." 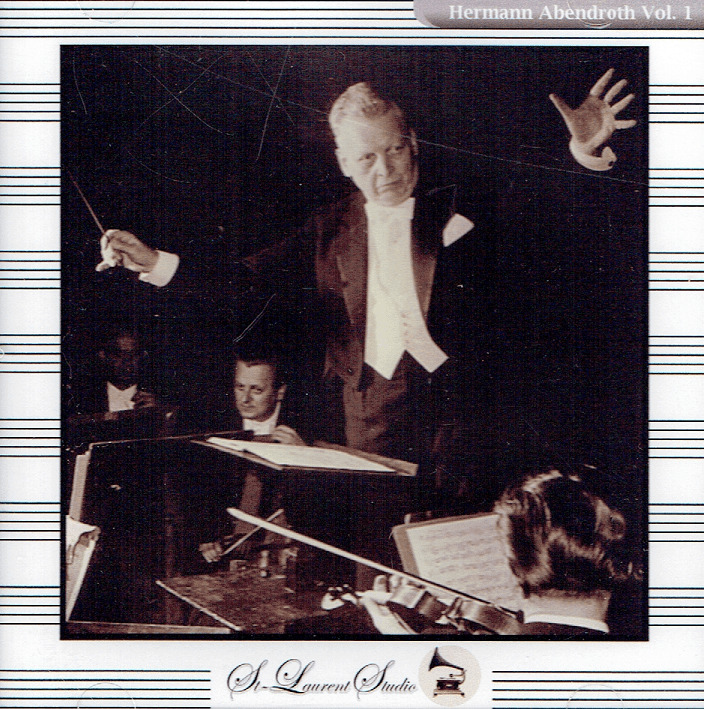 "Perhaps not a household name except to followers of exceptional, tradition-oriented conductors, Hermann Abendroth was born in Frankfurt am Main in 1883, the year of Wagner 's death, and he studied in Munich, where one of his teachers was Felix Mottl, the legendary conductor and former pupil of Anton Bruckner. His artistic life centered around Cologne and Leipzig. After being conductor of the Cologne Gurzenich Orchestra from 1915 to 1934, he spent eleven years as conductor of the Leipzig Gewandhaus Orchestra. He also directed the Cologne Conservatory and had a hand in forming the College of Music. His conducting was marked by his unpretentious objectivity, and this attitude corresponded with the way he pursued his career - straightforwardly and always thinking far ahead. He was an artist with roots to his home and his institution. Just months after World War II he was appointed musical director in Weimar, where he felt at home up to the time of his death in 1956. In 1949 he had also assumed the direction of the Leipzig Radio Symphony, and four years later of the Berlin Radio Symphony Orchestra. What all of his interpretations share is the sense of architecture and dramatic structure which always places the parts of a movement in the larger context. For Hermann Abendroth, interpreting meant performing a work to the best of one's knowledge, not distorting it whatever the cost with a reading of one's own."